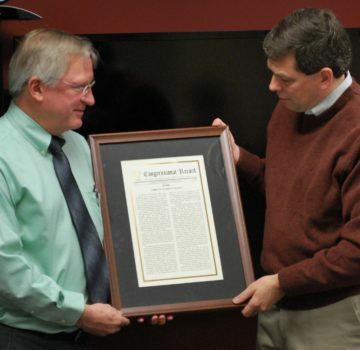 In recognition of his 30 years of service at the Engineer Research and Development Center’s Cold Regions Research and Engineering Laboratory (ERDC-CRREL) with the U.S. Army Corps of Engineers, Senator Mark Begich (D-Alaska) paid tribute to the work of Jon E. Zufelt, Ph.D., P.E., M.ASCE, by entering him into the November 20, 2013, Congressional Record. “Today, I wish to recognize and pay tribute to Dr. Jon E. Zufelt for his exceptional contributions to the nation,” said Begich as he stood on the floor of the U.S. Senate. “As a research hydraulic engineer, Dr. Zufelt’s career focused on solving tough problems in cold regions hydraulics and hydrology, ice jam processes, erosion and bank protection, ice mitigation, permafrost dynamics, seasonal water-quality issues, environmental remediation, and Arctic coastal processes affecting military lands. “Dr. Zufelt is a leader in cold regions engineering issues in Alaska and beyond. He is often sought out by universities, technical societies, and journals for his affiliation and technical expertise. Throughout his career, Dr. Zufelt has served for many years on multiple professional society committees and working groups, which include the American Society of Civil Engineers, the U.S. Permafrost Association, the Alaska Chapter of the American Water Resources Association, the Interagency Hydrology Committee of Alaska, and the Alaska Governor’s Sub-Cabinet on Climate Change. Zufelt, who is a member of ASCE’s Committee on Technical Advancement and the Technical Council on Cold Regions Engineering, is today employed as a senior hydraulic engineer in ice engineering for HDR Alaska, Inc., after leaving the federal government on September 3, 2013. Zufelt was first employed by the U.S. Army Corps of Engineers in April of 1983 as a civil engineer working in Vicksburg, Mississippi. 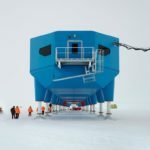 Later that year, he began working for the U.S. Army Engineer Research and Development Center’s Cold Regions Research and Engineering Laboratory in Hanover, New Hampshire. He relocated to CRREL’s project office in Anchorage, Alaska, in 2001. A large part of Zufelt’s new career with HDR is leading the Ice Processes Modeling Studies for the 600-megawatt, $5.19 billion Susitna-Watana Hydro project for the Alaska Energy Authority. Once it comes online in 2024, Susitna-Watana Hydro will provide long-term stable power for generations of Alaskans by generating 50% of the electricity needs, or 2,800,000 megawatt hours (MWh) of annual energy for Alaska’s Railbelt communities. As proposed, Susitna-Watana Hydro would include construction of a dam, reservoir, and related facilities in a remote part of the Susitna River. In addition to the Susitna project, Zufelt is also assisting with other ice projects, including ice jamming and shoreline erosion at Nicollet Island, along the Mississippi River in Minneapolis, Minnesota.